When the Southern humidity sets in, the last thing you want to worry about is wobbling around in uncomfortable shoes. No matter how adorable those delicate kitten heals truly are, it’s just too hot for that. Who says you can’t find some funky and fun shoes that are sensible, too? You’re in luck this summer. This season’s trends for your tootsies are as practical as they are pretty. From block heals and bright colors to fancy flats and sliders, finding a beautiful slip on that won’t give you blisters is easier than ever. To help you start your search, we’ve found functional styles you can effortlessly wear everywhere from the kids’ carpool to the resort pool. Take a look at a few of our favorite eye-catching and easy to walk in summer sandals, and you’ll be strutting it with support before you know it. Tassels and pompoms take this flat up a notch. This care-free slip on is wowing us with a beautiful bow and bold pattern. Sensible and stylish block heels add a little height to these still-comfortable summer sandals. You’ll be stylin’ in stripes and straps in this espadrille sandal. This lightweight and simple shoe is offered in a striking orange suede for summer. Sequins, beads, and braided details make this slip-on style somethin’ special. Flat and functional, the color of this sandal gives it a fun flair. Strappy and asymmetrical, these slip-ons are good-lookin’ and easy-going. A tiny block heal and lively tone makes these sandals as versatile as they are comfortable. You’ve tried bunny ears. You’ve tried books. You’ve even shelled out money on tools. But nothing seems to work—will your child ever be able to tie his or her own shoes? Never say never. A five-year-old just might hold the secret, in this story reported by our friends at Real Simple. With this trick, your child's shoes will even be double-knotted. 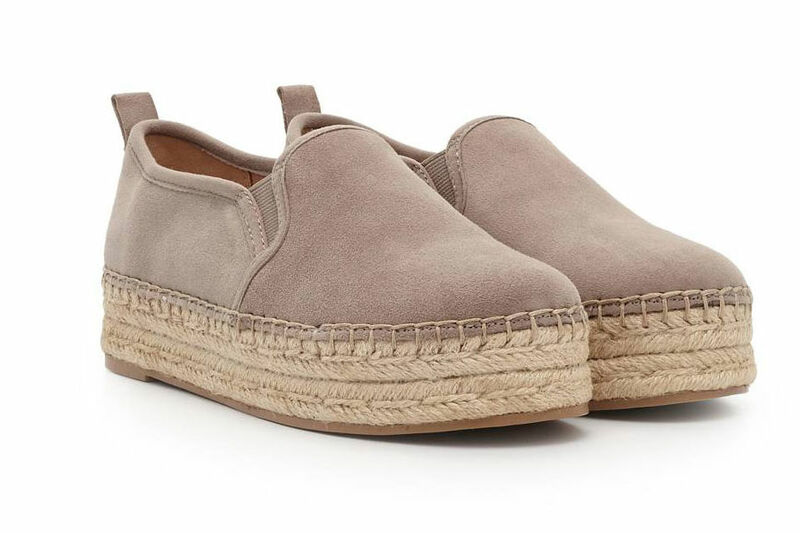 Trendy ties and summer suede make this espadrille sandal a fashionable favorite this season.